We FINALLY have a hard high-speed Internet connection and have uploaded our short wedding message that should have gone with our original post. See you all soon. It’s no secret to those on our Bhutan trip that Brad and I weren’t really prepared for our Himalaya foothills adventure. We had been so focused on the first phase of our trip – in the Thai beaches and our wedding that we didn’t think much beyond so when we arrived in Bhutan we needed a few additional supplies like warm clothes. I thankfully had my running shoes (not that I’ve done much of that), but Brad had 3 choices: flip flops, tevas, leather sandals – not exactly hiking material. We found a few layers, but trying to find a men’s size 12 or 12.5 US in Bhutan was comical. We checked nearly every footwear store in the two main cities and it got to the point people laughed. “No Big size in Bhutan.” In the end Brad made due and all was fine even if his toes got a bit chilled now and again. Then we went to India. While we really didn’t need the shoes there, we were thinking ahead to Japan. We’re big people wherever we go, but in India even more so as there are some little people there. They have some great style shoes but they are designed to fit Indian men who generally wear 8.5 or so. We had some hysterical adventures into the shoe shops. Indians – like many Asians – hate to say no or disappoint so when Brad would ask if they had big size, they’d say “yes” and bring out a US 10. He’d try and say it’s too small then they’d say “No, just stomp your foot”… as if he wedged his foot in it would stretch and miraculously fit. This went on for days. Even in Delhi where there are department stores and outlets for Nike, Adidas, Puma, Reebok – very few had anything bigger than a 46 – or 11 US. We even asked our friend Ram, who is about 6’4 for advice and he didn’t hold out much hope and told us to shop in Bangkok. When I asked where he got his shoes, he said, “US,” which he travels to once a month at least. So in Bangkok, it was like groundhog day…lots of shops, lots of shoes yet none that fit BIG BRAD. Many shops he’d ask for a 46 or 47 and they shop keepers /staff would just laugh or they were so eager to make a sale, they’d bring out shoes and say “Big size” and Brad would see it was only a 10 and walk out w/o a word. It was hysterical! Then in the ghastly Ao Nang Beach, Brad decided to try the Nike store and they had one pair of 46 – a pair of black Muay Thai boxing shoes. Couldn’t you just see the big American wearing these in Japan? So we’ve just arrived in Tokyo w/o any shoes and it’s dropped about 35 degrees since we were in Thailand. This is the first time he needs these shoes and the first store we walk into, the largest size is a men’s 9 and the man laughed and suggested we try the Nike store. Fall back plan? He’ll wear socks with his tevas. Stay tuned. Well we had big plans for doing more sightseeing upon our return to Thailand and after celebrating my b-day in Bangkok, but after India we decided hitting the beaches would be a nice respite. Then we had to decide where to go. The challenge was the Gulf – where we got married – was in the middle of monsoon season although we longed for The Sanctuary, we decided to head to Andaman Sea side. For anyone who has heard my recs on Thailand knows I say stay far away from Phuket unless you’re interested in a lil’ Bangkok filled with LOTS of big Europeans, Starbucks, McDonalds and girlie bars so we opted to fly into Krabi then had plans to reconnect with Eva (who did our fab wedding video) on Ko Phi Phi. Brad had never been to the east side and the last time I was there was a few months before the 2004 Tsunami. We’re on the verge of Thai beach peak season so if you like peace and serenity, Krabi, Ao Nang, Riley Beach, Ko Phi Phi, Phuket…not the best destination this time of year. Prices are outrageous and there’s too many people who look too much like you (if you’re of Western descent). Upon arrival in Krabi, we did what many don’t and headed straight for the Tiger Temple, which is built into the hillside, just about 8km from the airport. 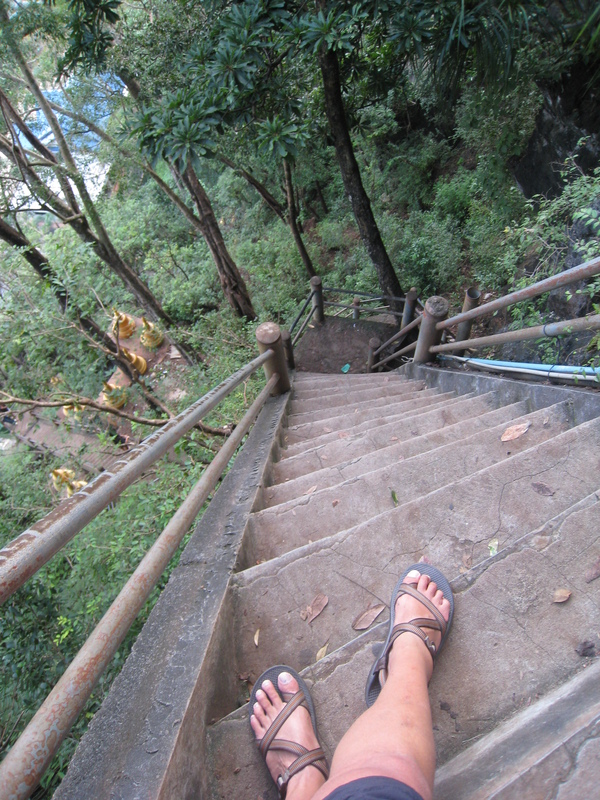 To reach the top temple, one must climb more than 1200 steps..in 100 % humidity. For two people who’ve done very little cardio in the past several weeks, we looked like we would pass out but the temple and view were worth it. Then we went to Ao Nang Beach. After stumbling through a couple tourist-laden days here and Riley, we abandoned Ko Phi Phi (the tons of tourists hanging off the ferry heading there drove the nail in the coffin) and opted for Ko Lanta. This is a much bigger island than Ko Phi Phi but without the density of resorts and people. While there are a few areas with adjacent resorts much of island is wide open. It’s like what Ko Phi Phi must have been 10 years ago, but bigger. We opted for a resort at the farthest end of island from the ferry terminal in Bamboo Bay. It was perfect. A few modest units built into the hillside with an exceptional restaurant right on the water and incredible staff who were most helpful and friendly. This is what Thailand is and should be…not the insulation of resort that cater to “farrongs” with every last amenity of home. If I wanted to go to Hawaii, I would. This was pure Thailand – except one part of the island that is home to a colony of historical sea gypsies. We took off on the scooters one day and went exploring and uncovered a tranquil part of the island then went to the Sea Gypsy village where they have their own dialect and most people look Polynesian. In fact, we could have easily been in some of the remote areas of Hawaii or Samoa. We enjoyed beach time, swimming (the water is about 78F), scootering, napping and even took in our first joint scuba effort. (Brad did a refresher). It was way too short, but if we make it back, we plan to spend much more time. We’re packing up our sandals and bathing suits and heading to Tokyo where we’ll spend three days along with a 2.5 day trip to Kyoto. Can’t believe we’re near the end…but really the beginning of our new lives in the Bay Area. November 12 — I heard before we arrived, that people tend to either love or hate India…or they maintain a love-hate relationship with it. I have to say…mine is a love-hate relationship. There was quite a bit I found fascinating, especially the fact that there is so much history there are truly beautiful people. I was deeply moved by Gandhi’s plight and his goals and principles and enjoyed visiting the place where he died and was cremated. If he wasn’t assassinated in the 1940s, I wonder if India would be different today. It’s a great country filled with great people, but there’s an undercurrent of “take.” People beg…they try to swindle tourists, they are always on “the take” to see if they can get more. One of the most memorable shopping experiences was when Brad taught a shopkeeper a lesson about haggling. First, he taught them the word then he proceeded to tell the man that he didn’t want to haggle and asked him why he was trying to steal from tourists with Indian prices and Tourist prices. The explanation? Because most people (tourists) will pay a higher price…so the part Pashmina shawls I eventually bought for 400 rupees (US $10=Indian price) started out as 1200 ruppees (US$30). The guys was so shaken by Brad, he asked him to write down the word “haggle” so he could know this for future. Below is a list of whys we started as we made our way through country… I’m sure anyone who has been to India can add their own and we’d love to hear. Why is people can ride packed like sardines in a tuk-tuk or car and travel on top of a bus and transport a family of 4, including an infant on a scooter, but it’s compulsory to put on a seat belt in taxi in certain regions? Why will a hotel pay a man to walk 100 yards back and forth for days to transfer small bowls of dirt on his head when he could buy a wheel barrel for $20? Why does every shop owner want you to sit to shop in their market? Why do tuk-tuk drivers expect you to pay more when they get lost for 20 minutes? Why is a horn more valuable than headlights after dark? Why do they bother to paint lines in the road when they are never used? Why must I have 2-for-1 drinks at happy hour and not just one at half-price? Why aren’t there incentives to keep family sizes low in a place plagued by overpopulation? Any other whys for you? Nov. 10 – We already noted the craziness of India roads but until we arrived in Delhi, we made a point of not driving any distances at night. Well, we made our first night drive last night to see my friend Ram Seethapalli, who I used to work with at Cendant in NYC, and his wide Ajita. We hired a taxi and as we pulled out of the hotel, I noticed there were no dash lights…no head lights and said something to Brad who didn’t seem concerned… so I asked the driver to turn on his headlights…well not so easy. He had to pull to the side of the road and change fuses until he got the lights to work. After we got started we quickly realized the driver’s horn didn’t work. Not a big deal in most places, but in India people honk for everything. It’s almost used as a rearview mirror. If you don’t honk, people don’t know you’re there. So we drove about 45 minutes to Ram and Ajita’s home without a horn. One the drive, I said I’d rather have headlights…Brad wanted a horn so the first thing he asked Ram and Ajita when he arrived is what they’d prefer and they overwhelmingly said HORN. Too funny! p.s. – thanks again to Ram and Ajita for a lovely evening. And, stay tuned for information about Ram’s new Indian venture. November 5 – We awakened early this am and were able to watch final electoral votes on the Indian affiliate of CNBC. Over the course of a few hours we watched McCain concede and Obama deliver his acceptance speech. We are left – like many Americans – hopeful. It was entertaining watching this from the Indian perspective as the media here is not quite as “unbiased” as the U.S. media pretends to be. One of our favorite comments came while a female Indian correspondent (they all seem to be female) based in Grant Park was interviewing a black Obama pundit in New York. He want on and on saying that Obama wasn’t the man for the job and seemed to whine a bit when the reporter cut his off and said “ok thank you, but I don’t think anyone in Chicago really wants to hear this right now.” Hilarious. We left the country too early to get a printed ballot card so we had to go to the U.S. Consulate in Kolkata when we arrived in India. People are constantly asking us where we’re from and when we say “America” many talk about “Obama” and “Bush.” Like us, most people here have little regard for our current U.S. president although most still revere the United States. Hopefully, Bush’s departure will help us begin to repair our reputation and garner more respect overseas. We hope.